Why does a knife need thinning? When cutting something there are two parts that affect the cut. The first part is the edge. How sharp is the edge and how smooth is the edge? The edge makes the initial cut. The edge will go through the skin of for example a potato. The second part is the geometry behind the edge. Or how thin the blade is behind the edge. The geometry behind the edge affects how the knife slides through the product. A blade that is thin behind the edge will glide through the product easily. This gives a clean and smooth cut. 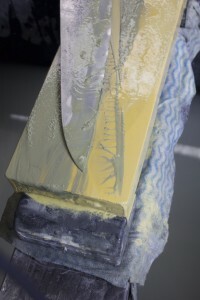 A knife, which is thick behind the edge will give more resistance and will require to be pushed through rather than glide through the product. For example when you cut a potato, the knife will push away the potato and will break off rather than slicing through. Most of the time people sharpening knives overlook this, they forget to thin the blade. 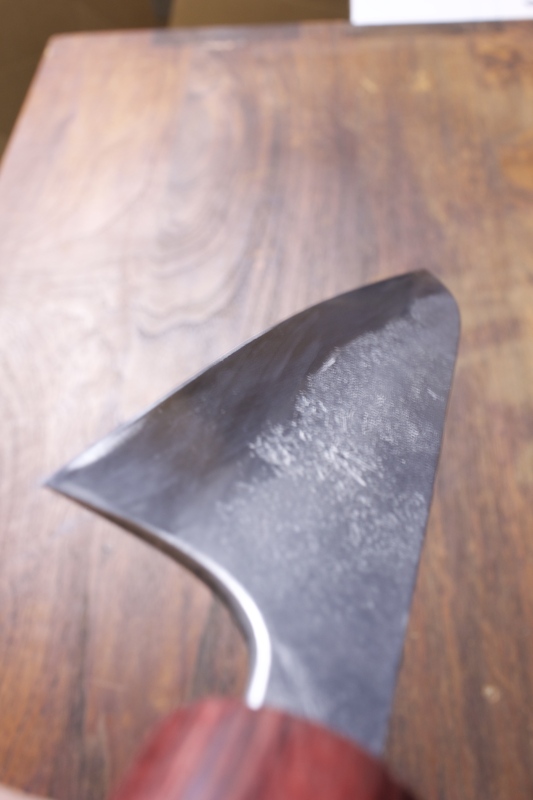 Knife thinning does not need to be done as frequently as sharpening the edge. What is Artisan Knives thinning process? To make a knife perform well, we occasionally need to thin it down to reduce drag while cutting. Eliminating wedging while cutting is important to a good cutting knife. I use a 4 step process to thin down a knife. I am going to use a Japanese laminated blade. In this instance a Masakage Yuki petty knife. 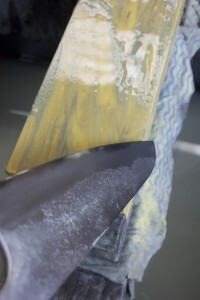 Knife thinning can be applied to both Western and Japanese knives. 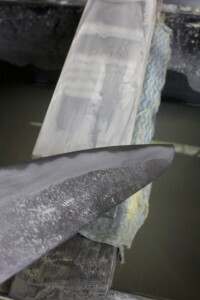 Thinning is done by holding the blade at a very shallow angle over the sharpening stone. Firstly, I use a coarse stone (a 220 grit, pink brick). The coarse stone does the hard work of steel removal, until I come to the desired thickness. The coarse stone will leave deep scratches, which I will then delete in the next steps with finer grit stones. Second step is the 1000 grit Imanishi stone. This stone softens the deep scratches, and starts to show the contrast between the Hagane (hard steel) and jigane (softer cladding steel). Third step, we move onto the 4000 Grit Imanishi stone. This stone is great as it s very muddy and the mud helps with making good contact between the abrasive material of the stone and the blade. At this stage it is more about refining than steel removal. And we get to a stage where it is almost perfect. I like this stone a lot because it gives a nice polished finish both for thinning and regular sharpening. It shines up the bevel nicely and you know your edge is refined. Fourth and final step is to make the knife look perfect. To achieve this I use a Natural finishing stone, to refine the polish on the Shinogi. And it also makes the knife look professional. The contrast between the hard and soft steel is what they call Kasumi finish. For Western knives I use a polishing machine to make the blade surface smooth and shiny.